The Joint Venture formed by Panedile and TESUR which belongs to the Techint Group, acquired equipment for the tasks of repair and improvement of the Gral. 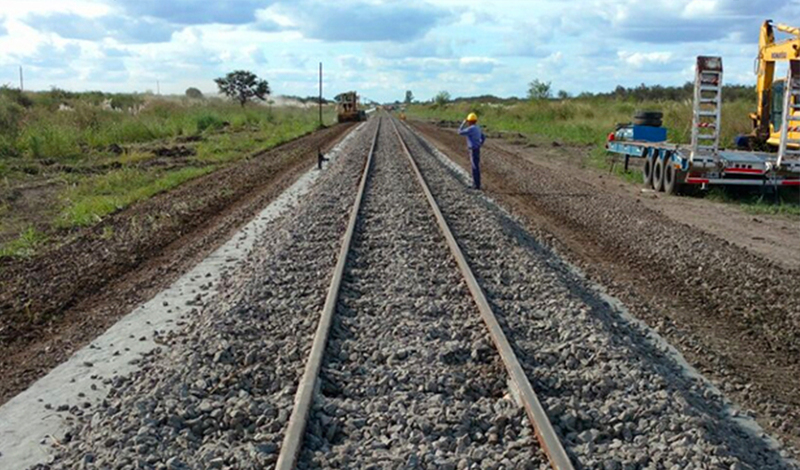 Belgrano Railroad in the province of Santa Fe as well as for future railway projects . The equipment acquired are a tamping-aligner and a ballast distributor, both bi-gauge and of Austrian origin. In the photos can be seen the arrival of the tamping-aligner (BL 08-16 Split Head) at the port of Buenos Aires. The Panedile-Tesur joint venture is carrying our works to repair 64 km of narrow gauge railways (1000 mm) in the Ferrocarril Belgrano stretch between the towns of Santurce and Esteban Rams in the Province of Santa Fe. The repair work of this section involves removing the existing track and laying new rails, concrete sleepers and fastenings. In addition, 30 cm of stone ballast will be added, rails welded and the finishing for the railway line that will provide better safety conditions for trains with a greater load-bearing capacity.